This module will introduce you to theories of the European Union and European integration. In the short video above Dr Karen Heard-Lauréote discusses why we study European Integration. The module will start by setting out the case for theory, essentially asking what theory is and why we need it. This will be followed by an analysis of different interpretations of the nature of the EU, i.e. how should the EU be conceptualised? Following this analysis of ‘grand theory’, we will look at the ‘mid range’ theories including the ‘new institutionalisms’ (historical, rational and sociological), multi-level governance and finish by addressing some of the more recent constructivist approaches to the study of the EU. 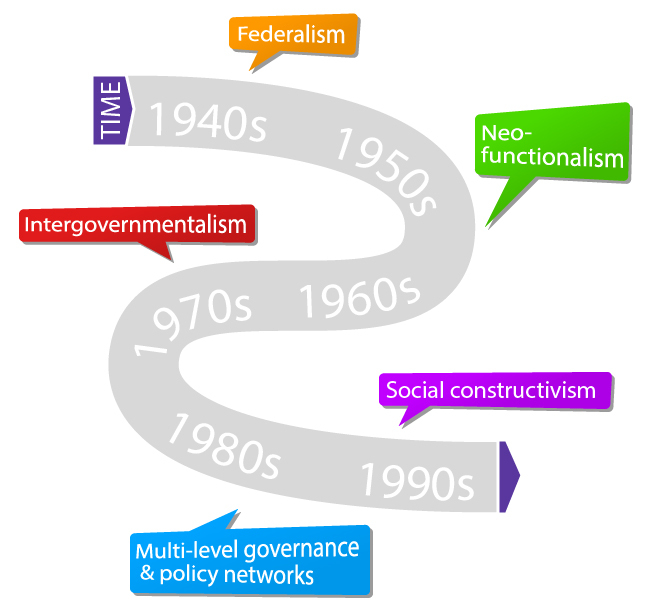 Timeline of the different theories discussed in this module. Above: click here for a non-Flash version (e.g. if you are using an iPad). Theories can be difficult to understand at times. This module has been designed so as to break them down to their most fundamental aspects, enabling you to grasp each theory as we go along. Throughout the module there will be explanations of the central concepts and difficult terminology. It may be advisable to re-read any sections that you find difficult as the module will build on the knowledge you acquire as you go along. Some of the terms and phrases will be familiar from earlier modules in this unit; this time, however, we will delve further and you will emerge at the end of this module with a deeper understanding and a more nuanced appreciation of the European Union. As you go through the module, it is important to bear in mind the historical setting in which these theories developed. As you continue through the module, think about how the historical setting of the time may have affected the theory produced.